Text by Shraddha Jahagirdar-Saxena. Photographs by Akash Mehta. After a mid-morning flight to Goa, we find ourselves walking out into a sun-drenched landscape. The drive to Calangute is pleasant – a refreshing break from the urbanscape of Mumbai as we pass through several small villages on palm-lined roads to our destination, The Park on Holiday Beach. The small boutique hotel, that is the Park Hotels’ first in Goa, stands right on the beach in the heart of the buzzing Calangute strip in North Goa. The 30-room property, that adds to the group’s distinctive design-driven hotels in the country, has a location that envelops its guests in Goan susegad – the region’s more tranquil and relaxed approach towards life that is celebrated by all who visit the state. After dropping off my luggage in the Executive Suite – decorated in white as is the main property that houses all the well-appointed rooms, I walk out for a late lunch to the restaurant where the chefs rule supreme. Passing the open-air swimming pool and then walking down a short flight of steps takes me to the only eatery in the small hotel. Post a leisurely lunch – which we leave to the chefs’ excellent judgement – we sit down to draw up the plan for our food shoot. The restaurant has been blueprinted with utter simplicity. The huge windows, that are left open, let the cool sea breeze in and the view is magnificent. But, it is the open kitchen, whose preparation area is in the restaurant, and is a permanent hub of activity, that naturally becomes the focus of our interest. 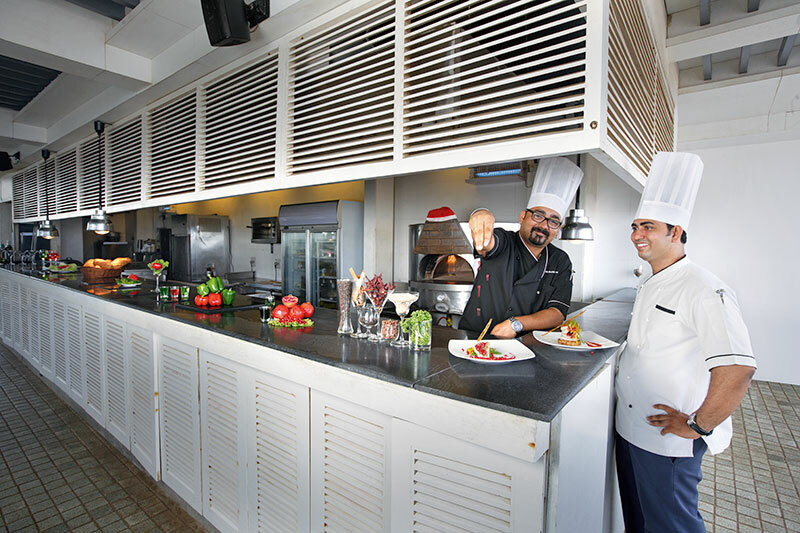 The two main performers – Chef Zorawar Singh Ahluwalia (known more popularly as Chef Z) and Chef Sunil Rathod – are completely in their element in the space they rule over. 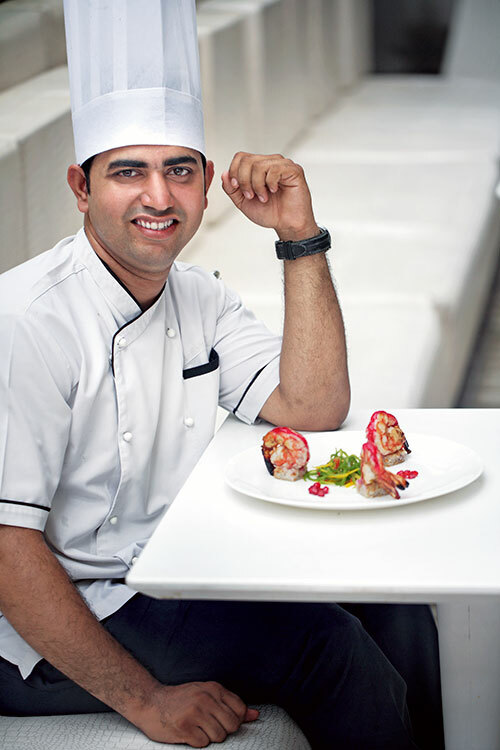 The executive chef is known for his tradition of providing distinct culinary experiences. Reputedly the youngest executive chef at the age of 25 and the youngest corporate chef at 26, Chef Z is known to transform food into a work of art and has worked in some of the world’s top kitchens – and has received plaudits from top chefs like Chef Jamie Oliver, Chef Morimoto, Chef George Blanc, Chef Alain Ducasse and Chef Hemant Oberoi. 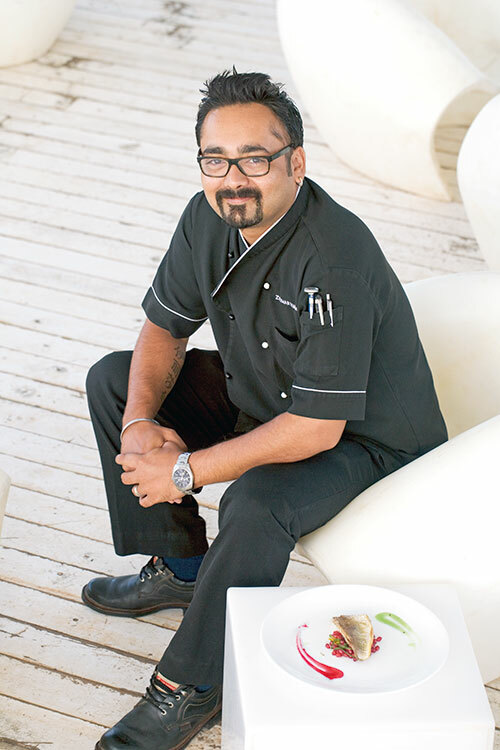 Chef Rathod is known for his expertise in Goan food delicacies and has also worked for kitchens of not just the Park Hotels but other diverse leading groups – each stint honing his expertise. In an interesting aside, we get down to chatting about the often underrated fruit – the pomegranate. It is funny looking and like the custard apple, tough to seed, but once you get the technique of doing it, you are in for a delicious treat that is packed with nutrients. Not only are pomegranates a great vegan source of iron, but the seeds are also full of Vitamin B, potassium and folic acid. Some studies have shown that they may also help prevent cardio vascular diseases. By now, both the chefs have got everything ready – cooked to perfection. Each element that makes up the plates is ready. As Chef Z puts it, “Innovation is important in our industry. And the key to innovation is to keep the authenticity of the ingredients alive and at the same time give the dish a more modern feel.” A blend that, like Oliver Twist, leaves me wanting for more! Ingredients: Prawns 18-22, 5 nos; Periperi masala, 200 gms; Fresh pomegranate 1 no; Goan rice 100 gms cooked; Peppers (red and green) 50 gms. Method: Marinate the prawns in the periperi masala and grill. Set aside. 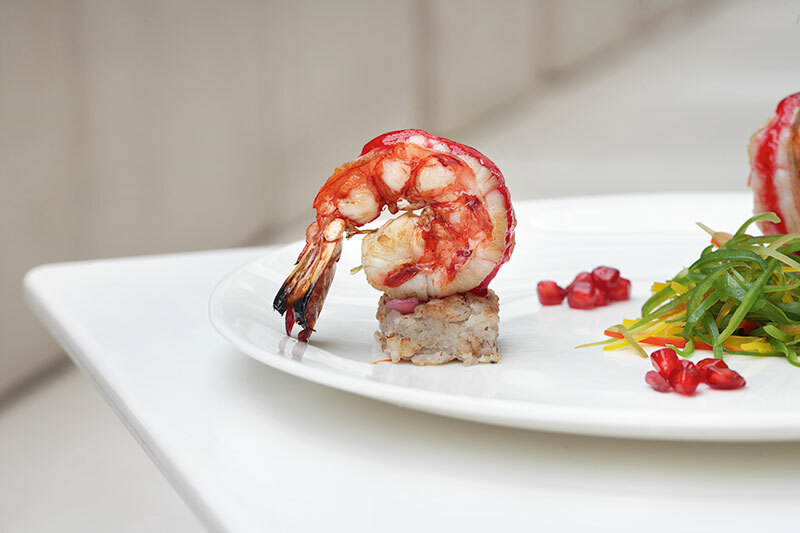 Toss the grilled prawns with fresh pomegranate pearls and olive oil. Plate the prawns on the de-moulded Goan rice patty. Garnish and serve. Ingredients: Kashmiri chilli, 100 gms; Toddy vinegar or cider vinegar, 50 ml; Cinnamon, 10 gms; Jeera whole, 10 gms; Oil, 30 gms; Star anise, 5 gms. Method: Dry roast the cinnamon, jeera, red chillies and star anise. Blend in a mixer with oil and toddy vinegar. Ingredients: Coconut, 1 no, grated; Cashews, 10 nos; Almonds, 10 nos; Onions, 2 nos, sliced; Onions, 2 nos, chopped; Ghee and oil, for frying. Method: Add three cups boiling water to the grated coconut. Cover and keep aside for 30 minutes. Grind to a fine paste, with water; extract milk; keep aside. Heat ghee in a large deep vessel. Add cashews, fry to a light golden, drain, keep aside. Add almonds, fry lightly, drain, keep aside. Fry the sliced onions, till crisp and brown. Drain well, keep aside. Add the chopped onions, stir-fry till transparent. Add the washed drained rice, coconut milk, salt. Bring to a boil, simmer till rice is cooked, but each grain is separate. Allow all excess moisture to evaporate. Make patties of this rice with all the prepared ingredients. Add pomegranate seeds to it. Fry the patty in hot oil and use as a base for the prawns. 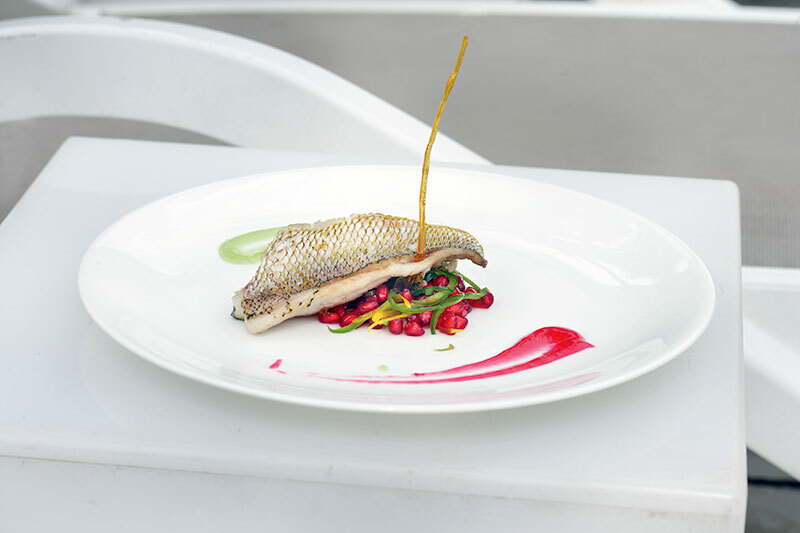 Ingredients: Snapper fillet, 1 no; Fresh pomegranate, 1 no; Peppers, all three colours 1 no; Olive oil; Lemon juice, as required. Method: Marinate the snapper with olive oil and lemon juice, salt and pepper. Chargrill it skin side first until crispy. Set aside. Ingredients: Pomegranate juice, 4 cups; Honey, 4 tbsps; (you may also use molasses for a deeper, darker sauce); Sherry, 1 tbsp; Bay leaf, 1 no; Olive oil, 4 tbsps; skin from one apple. Method: Simmer all the ingredients in a pan until reduced by half. Strain before using. You may also add chopped shallots or slivers of garlic for a more savory sauce. Rosemary or other fresh herbs are also a nice touch, especially with lamb. Ingredients: White-wine vinegar, 1 tbsp; Dijon mustard, 1 tsp; Extra-virgin olive oil, 2 tsps; Medium bell peppers 4 nos, (1 red, 1 yellow, 2 green), stemmed, seeded, and thinly sliced lengthwise; Celery stalk, 1 no, halved crosswise and thinly sliced lengthwise; Chopped fresh thyme leaves, ¼ tsp; Coarse salt and ground pepper. Method: In a large bowl, whisk together vinegar, mustard, and oil; season with salt and pepper. Add bell peppers, celery, and thyme; toss to combine. Season according to taste, with salt and pepper dust and serve. Pour the reduction on the bottom of the plate followed by the slaw and finally with the crispy skinned snapper. Sprinkle some pepper dust and serve. Fry some spaghetti in oil and twist to any shape when warm and place on the plate. Take some readymade pesto and garnish on the plate.